It’s Friday! You know what that means – new music to reign in the weekend. As the week winds down, we have some heaters hot off the studio press. First, we have English R&B singer/songwriter Jorja Smith bringing us a little bit of jazz-tinged soul and dreamy lyrics in her new debut album. Then, Nashville indie folk singer-songwriter Erin Rae releases her new album that reaches beyond the edges of country music. Last, but certainly not least, doom metal band YOB is back and stronger than ever with their new album. All these musical treats are Out Today! The wait is over: Jorja Smith highly anticipated debut album Lost & Found is here. At only 20 years old (21 in three days! 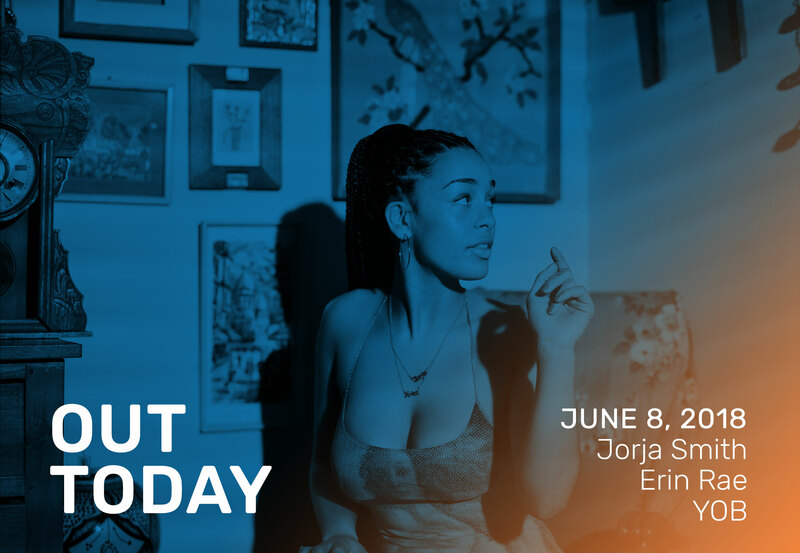 ), Jorja’s music conveys maturity and realistic feelings of being in love. The debut album comes after a set of impressive collaborations with the likes of Drake, Kendrick Lamar, Kali Uchis and Khalid. This two-years-in-the-making project includes some of the singles that helped put Jorja Smith on the map including “Teenage Fantasy,” “Where Did I Go?” and”Blue Lights.” On the album, Smith creates playful and infectious sound to compliment her pop spirit and youthfully charismatic storytelling. With a BRIT Award win, millions of streams and 10 magazine front covers in just two years, Jorja is rounding the bend to international stardom. Check out her music video for “Blue Lights” before delving into the rest of the album. Like what you are hearing and want to see her live? You’re just in luck because coming this October, she is embarking on a European tour, including two nights at London’s O2 Brixton Academy. Nashville breathes out new music with Erin Rae‘s latest album Putting on Airs through Single Lock Records. Rae’s country influences and the southern lilt in her voice come through in the narrative depth of her songwriting. The album’s heightened track “Bad Mind,” is about Rae’s experience dealing with the long process of coming out in a community where it wasn’t common or easily accepted. Chris Griffy of AXS points out that, ultimately, she comes to accept the fact that embracing her own happiness would make her an outsider to many in her community. Who better to partner with than Alabama-based label Single Lock Records, a label that specializes in releases that reintroduce fans to traditional artistry with a refreshing modern twist. Rae’s new album challenges the stereotype of what a southern female singer should be with Rae’s voice that is demanding “attention in a crowded genre” (AXS). See the video for “June Bug” that compliments Erin’s psychedelic folk rock/country song with the ideal visual edge and listen to the entire album, out now. Last year was a tough year for metal band YOB as the world nearly lost vocalist/guitarist Mike Scheidt. Mike had to undergo intensive surgery for an extremely painful intestinal disorder. But the singer pulled through and after an arduous rehab process (and a lot of money raised in a GoFundMe campaign by fans/friends), he recovered and was able to create YOB’s eighth studio album Our Raw Heart, out today through Relapse Records. YOB’s last full-length album Clearing the Path To Ascend was one of 2014’s most heralded releases, named Metal Album of the Year by Rolling Stone and appearing in countless “best of” lists from Pitchfork, Decibel, Stereogum, Noisey and more. This trio makes yet another powerful and cathartic release that we expect will also hit “best of 2018” music lists. Whether you are a metalhead, headbanger or something else, we’re sure you’ll like the heaviness of this album that buoys instead of bashes. A brilliant musical offering, this aggressive, eclectic and impassioned release is truly the band’s finest work to date and the epitome of what heavy music means. Listen to the title track before transcending into 75 minutes of ultimate doom. Thanks for listening. We hope you enjoyed this week’s Out Today. Catch you next week. Until then, happy listening!